In a country that is teeming with life and yet ironically teetering at the brink of widespread species loss, it comes as no surprise to see that some of its most notable and iconic endemic species are also among the most threatened. The Philippine Eagle, the country’s national bird, is the largest eagle in existence in the world. Found in Eastern Luzon, Samar, Leyte, and Mindanao, this eagle is estimated to have anywhere from 250-750 individuals remaining across the country, with about one-third belonging in Mindanao. This small population continues to be threatened by habitat destruction through forestation destruction and fragmentation, as well as uncontrolled hunting and inadvertent capture in traps meant for other animals. Endemic to Mindoro, the tamaraw is another animal that bears symbolic significance to the Philippines. The number of mature individuals have dwindled down to less than 250 (around 300 total individuals) and is expected to drop further by 25% over the next three generations according to IUCN’s 2008 assessment. Habitat encroachment caused by farming and other agricultural needs, as well subsistence and sport hunting in the past, have contributed to the dramatic population decline. 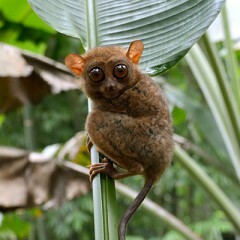 Making the southeastern portions of the Philippines its home, this tarsier is distinctive due to its quirky appearance. These animals are not quite as depleted as the others in this list, but they still face risk of critical population drops due to high infant mortality rates both in the wild and in captivity, a highly specialized diet, limited geographic range, high population density, and habitat destruction. To their credit, tarsiers can adapt to secondary habitats. One of the most endangered freshwater crocodiles, this species was previously considered as a subspecies of the Crocodylus novaeguinae (New Guinea crocodile). Population numbers are uncertain, but it is believed that there are less than a hundred individuals left in the wild. This species suffered massive losses in numbers due to excessive hunting for commercial use in the past. Today, while protected from hunting, the destruction of their natural habitats are pushing them further to the brink. Listed with population numbers of fewer than 2,500 individuals as of 2008, as well as observed continuing decline, the Philippine Spotted Deer was only recognized as a separate endemic species in 1983. While capable of inhabiting various habitat types, this species is still adversely affected by habitat fragmentation and destruction, as well as hunting, in which case inadequate law enforcement is appearing to be a hindrance to effective species protection. It’s important to note the brief list above covers only animal species – vertebrates, at that. Apart from several more faunal species that fall under the various Red List categories and criteria, there are also several more unique species of invertebrate fauna and plants that likewise make their home in Philippine territory and face the same survival risks as the ones listed above. A lot of them may even be yet unknown to science, but are already at risk of being completely wiped out before they could be discovered and described. BirdLife International 2012. Pithecophaga jefferyi. In: IUCN 2013. IUCN Red List of Threatened Species. Version 2013.1. . Downloaded on 02 October 2013. Hedges, S., Duckworth, J.W., Huffman, B., de Leon, J., Custodio, C. & Gonzales, J. 2013. Bubalus mindorensis. In: IUCN 2013. IUCN Red List of Threatened Species. Version 2013.1. . Downloaded on 02 October 2013. Shekelle, M. & Arboleda, I. 2008. Tarsius syrichta. In: IUCN 2013. IUCN Red List of Threatened Species. Version 2013.1. . Downloaded on 02 October 2013. Crocodile Specialist Group 1996. Crocodylus mindorensis. In: IUCN 2013. IUCN Red List of Threatened Species. Version 2013.1. . Downloaded on 02 October 2013. Oliver, W., MacKinnon, J., Heaney, L. & Lastica, E. 2008. Rusa alfredi. In: IUCN 2013. IUCN Red List of Threatened Species. Version 2013.1. . Downloaded on 02 October 2013. Why are We Losing Species?